Note: Use with Pure-Clenz Solution for natural cleansing of the wound. How has Pure-Heal Gel helped others? What does Pure-Heal Gel contain? How do I use Pure-Heal Gel? How long will a tube of Pure-Heal Gel last? What do I need to know about Burns? How do I treat minor burns at home? What must I do for major burns? The world can be an obstacle course, in the home, workplace and schoolyard. Tripping over toys, the dog or slipping on the kitchen floor can lead to common and minor cuts and scrapes. These minor wounds can be dangerous if left untreated. It is important to keep wounds cleansed and promote healing and recovery. Always clean up spilt liquids off the floor and take extra care when getting in and out of the tub or shower (use a non-slip floor mat). Keep children’s and pet’s toys neatly tucked away in a cupboard or box. Garden utensils should be kept in a shed instead of lying in the garden or propped against a wall. Always use oven gloves to remove hot items from the microwave or oven. If children’s shoes are slippery underneath, try having them lined on the bottom with rubber or a firm grip material. Every home needs a first aid kit on hand for on the spot treatment of day to day family mishaps. Pure-Heal Gel is a 100% safe and natural topical herbal remedy which works to assist the natural healing ability of the skin in recovery from wounds, minor burns, grazes and bites. Pure-Heal Gel has been formulated as a natural companion to our effective Pure-Clenz Solution - for complete care of your family's minor wounds, abrasions, burns and insect bites. Pure-Heal Gel contains a carefully selected combination of well known and respected traditional herbal remedies for promoting natural healing. The soothing gel base and subtle lavender aroma also provide an immediate comforting effect. Like all Feelgood Health products, Pure-Heal Gel has been developed with care by our practicing Clinical Psychologist and is manufactured according to the highest pharmaceutical standards. Individual ingredients are well-researched and have been specially chosen for their high safety profile in family health. "Pure-Clenz Solution (and Pure-Heal Gel are) the mainstay of my medicine chest at home. Between my husband, a DIY enthusiast, our three children and myself we must use (them) at least once every week in our family. It is the only product that I ever use as it works fantastically. My children love (Pure-Clenz) because it doesn’t sting ...... and it stops the bleeding right away. We always use your Pure-Heal gel afterwards and are thrilled with the way they work. So far no infections and no scarring in our family!" "My daughter and I both react terribly to any kind of insect bite and living in Houston we get plenty. The bites always swell up, go all red and itchy and we can’t help scratching. Both of us have scars on our arms and legs - my daughter even has one on her face. I saw your website and decided to try Pure-Clenz and Pure-Heal. The results were so amazing that I just had to write in and tell you. I use them for everything and Pure-Heal is great for those little burns and scalds in the kitchen too." Calendula Officinalis (Marigold) is one of the best and most well known herbs for local skin problems. Calendula will also promote the natural healing ability of the skin and help to reduce scar formation by stimulating healthy skin and tissue regeneration. These properties make Calendula an ideal topical skin remedy. Melaleuca Alternifolia (Tea Tree) is a well known herb which has been traditionally used for centuries by Aboriginal Australians. The powerful healing and protective qualities of Tea Tree are enhanced by its ability to penetrate the skin. Lavandula Officinalis (Lavender) not only imparts a beautiful, soothing fragrance, but will also promote healthy circulation to the skin thereby enhancing the body’s natural healing processes. In addition, the aromatherapy properties of Lavender will also help to comfort and soothe the individual. Centella Asiatica (Gotu Kola) has been used as a medicinal herb for thousands of years in Ayurvedic, Chinese and Indonesian traditions. Legend has it that an ancient Chinese herbalist lived for more than 200 years as a result of using the herb and this has led to Gotu Kola being called one of the “miracle elixirs of life”! Gotu Kola contains compounds called triterpenoids which aid the natural healing process by strengthening the skin, increasing the concentration of anti-oxidants and maintaining healthy blood supply to the affected area. Aloe Ferox (Aloe) has been traditionally used in wound healing since ancient times. The Egyptians were using Aloe as early as 1500BC. Aloe contains a number of active compounds that have proven healing properties and an excellent effect on skin health, growth and repair. It is not surprising that Aloe has a history of being a common household remedy and is found in many commercial skin care preparations! These herbal ingredients are combined in a soothing aromacare gel base. Apply to the affected area two to three times daily, preferably after cleansing with Pure-Clenz Solution. For best results apply Pure-Heal Gel after cleansing with Pure-Clenz Solution. The soothing effects of Pure-Heal Gel will be felt immediately. Regular use thereafter will be of benefit in assisting and speeding the natural healing processes of the skin and underlying tissue. This will depend on the size of the affected area as well as how frequently the product is used. 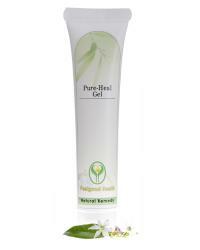 Pure-Heal Gel comes in a 20g tube. Burns are not uncommon and most of experience minor burns at various points in our life. Children can be particularly vulnerable to burns, especially in the kitchen, as they do not always understand the consequences of their actions. More serious burns can have devastating physical health and psychological consequences. It is in all of our best interests to know how to handle burns at home. First-degree burns – only the outer layer of the skin (epidermis) is burnt on the surface. The skin is usually red with swelling and pain sometimes present. First-degree burns can be treated as a minor burns unless they involve a major joint or substantial portions of the feet, hands, face, groin or buttocks. Second-degree burns – the epidermis has been burnt through and the dermis (second layer of skin) is also burnt. The skin becomes intensely red and blotchy and blisters develop. Second degree burns cause severe pain and swelling. If they are less than 2-3 inches in diameter they can be treated as minor burns. If the affected area is larger than this or involves the face, hands, feet, buttock, groin or a major joint, you will need to seek emergency medical help. Third-degree burns – these are the most serious burns and involve all layers of the skin and possibly even underlying fat muscle and bone. These burns require emergency medical attention and may be accompanied by smoke inhalation and respiratory difficulties. Cool the burn – hold the burnt area under cool running water for at least 5 minutes or until the pain subsides. If this impractical, then immerse the burnt area in cold water. Cooling will reduce swelling by conducting heat away from the skin. Do not put ice on the burn – this can cause frostbite and further damage to the area. Do not apply oil or butter to the area. Cover the burn with a sterile gauze bandage wrapped loosely to avoid putting pressure on the burn. This will keep the air off, reduce pain and protect blistered skin from further damage and infection. Do not use fluffy cotton wool which can further irritate the skin. Minor burns generally heal well with careful home management. Should you see any signs of infection such as increased redness, pain and swelling or oozing please seek medical attention. It can take up to a year before the new skin of a healed burn is as “tough” as the rest of your skin so it is important use sunscreen on the affected area. Major burns will require emergency medical attention. These include second degree burns that are larger then 2-3 inches in diameter and/or involve the hands, face, feet, groin, buttocks or a major joint as well as all third degree burns. Check for circulation signs including breathing, coughing, pulse or movement. If there is no breathing or other signs of circulation begin CPR if you are able to do so.